Release your alter ego with the Sultry Black Bob Side Fringe Wig. This super-short style curves around your face before sitting at your chin, perfectly framing your face. As the side fringe sweeps across your forehead, it creates a flattering, sophisticated finish. 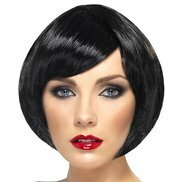 This sultry wig promises to enhance any glamorous outfit you choose to slip into. Please note this wig is not heat resistant and should not be styled with heat products. I regularly dress up as a girl for fun with the costumes bondara have to offer so when I saw they had wigs too, i was over the moon! my whole outfit is from Bondara and i love it all. such good quality. felt like uma thurman wearing this!! stole my boyfriends white shirt and i was aaway - great role play.